Since its origins, Breguet has created some of the most appreciated timepieces among Ladies which love their unique grace and exquisite femininity. The new Classique Phase de Lune Dame ref. 9088, that Breguet presented as a Baselworld 2016 preview, makes no exception and beautifully captures the quintessential Breguet style. This new timepiece is made even more fascinating by the presence of one of the most poetic complications in watchmaking: the moon phase, here positioned at 6 o'clock together with small seconds. The 30 mm fluted case is available in white or rose gold with a sapphire crystal to protect the grand feu enamel dial, individually numbered and signed Breguet. Arabic numerals mark the hours while the minutes track is decorated with tiny stars and stylised fleurs-de-lys for the five-minute fractions. Breguet open-tipped hands in blued steel completes the dial which is also available in a mother of pearl version. In the picture, the bezel and lugs are set with 66 brilliant-cut diamonds for a total of 1.04 carats but the Classique Phase de Lune for Women will also be available in a version without diamonds. A second sapphire crystal is used for the case back to display the automatic Breguet calibre 537L with its Côtes de Genève decoration and gold rotor with barley grain guilloché. Beating at 21,600 vph with a power reserve of 45 hours, this movement features a lever escapement in silicon and a silicon spiral. 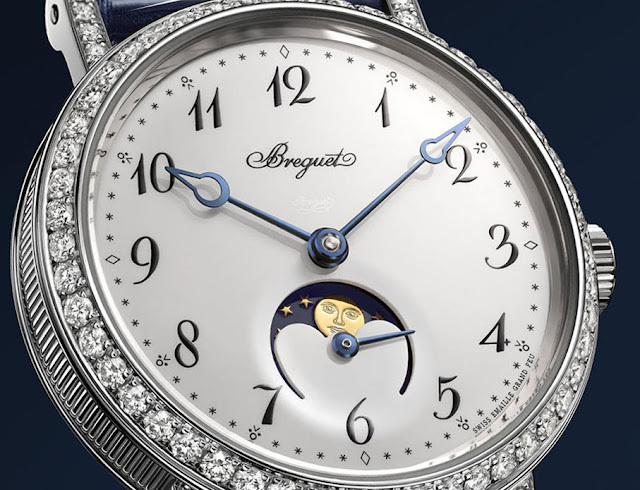 Breguet Classique Phase de Lune for Women. Since its origins, Breguet has created some of the most appreciated timepieces among Ladies which love their unique grace and exquisite femininity. 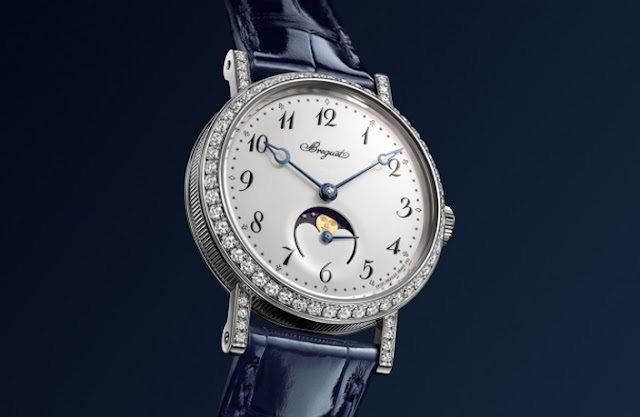 The new Classique Phase de Lune Dame ref. 9088, that Breguet presented as a Baselworld 2016 preview, makes no exception and beautifully captures the quintessential Breguet style. 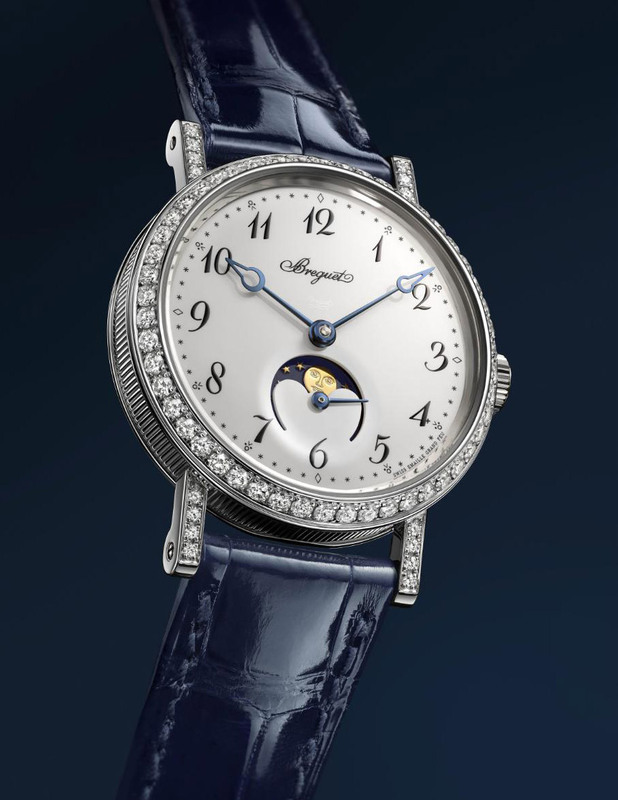 The Breguet Classique Phase de Lune for Women is completed by a black leather strap with matching gold buckle. Prices will be announced later in the year.